Here at Guanabana we like to spice up the important occasions - so when it comes to treating the creator of life and the most important woman in your life, your mum, we want to make sure that we offer her and you a token of our appreciation. 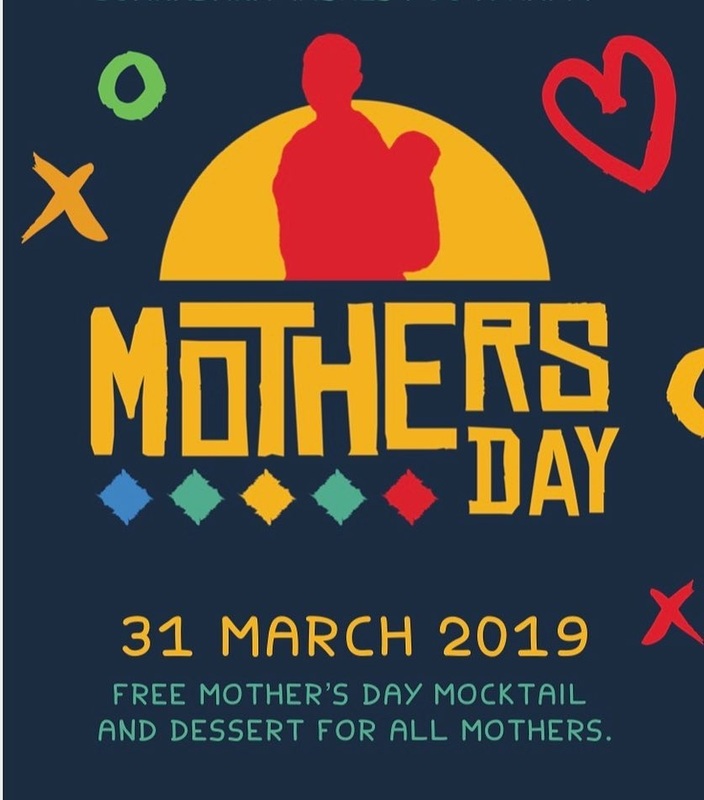 This Mother’s Day, we are treating all the mothers that walk through the Guanabana doors to a refreshing Hibiscus & Ginger Mocktail to start their meal with and a portion of our delicious Churros (topped with a scoop of our signature ice cream) to finish with. It’s our way of showing the amazing women and amazing mammas in your life how much we appreciated all that they do. GUANABANA, THE RESTAURANT OF ROMANCE. Valentines is fast approaching, what better way to tell your partner that “no one be like you” then with good food, romantic reggae, and a chill vibe. 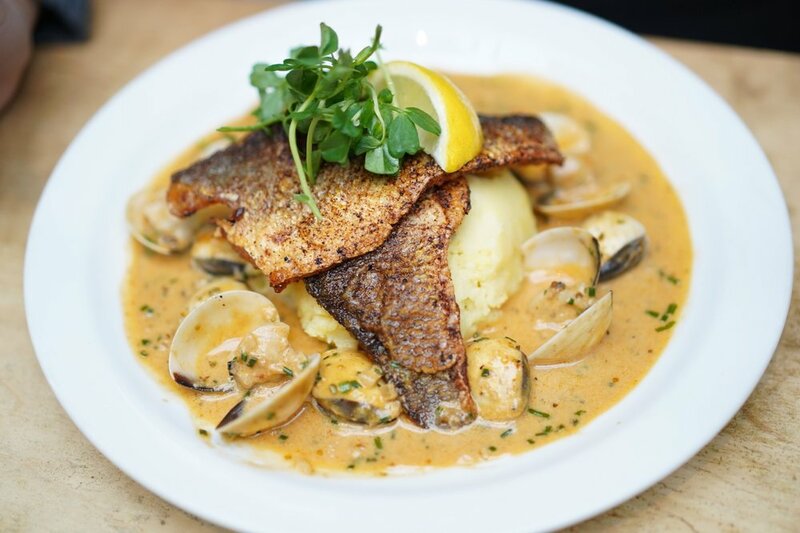 If Paris is the city of love, then Guanabana is the restaurant of romance. It’s the perfect place for first dates. We’ve even had a couple weddings! Treat your partner to an experience they will always remember. For only £30 per head, you can enjoy a 3 course meal from our new limited edition valentines menu. Its only for one day, an opportunity you can’t miss out on! This Valentines, we decided to branch out and do some african dishes. One of these being the mixed seafood fry up platter. This starter includes calamari, fried prawn, white bait, mussels, and fried cassava. Great for sharing with that certain someone. We also Surf and Turf Suya. 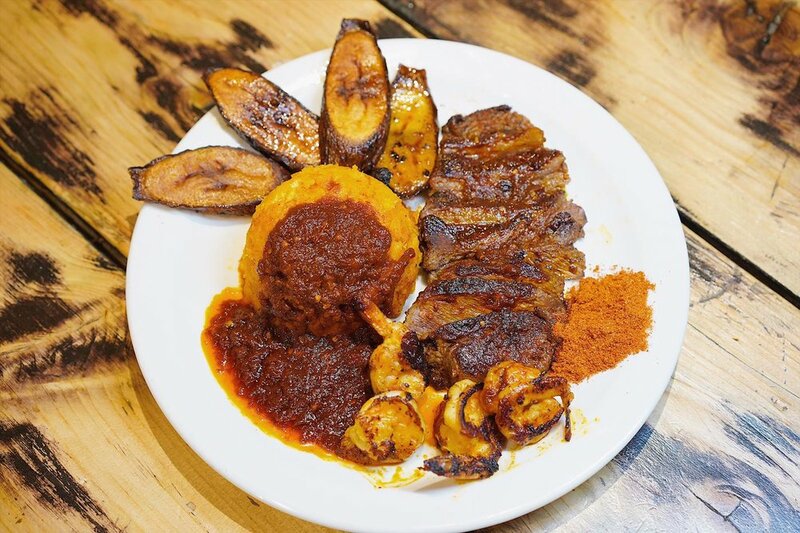 This dish combines fried Suya shrimp and chopped Suya steak. Suya is a popular african dish typically served on a skewer and marinated in spicy Suya seasoning. Got a sweet tooth? We got you covered with our in house baked gooey plantain and chocolate cake. Bursting with flavours from the Caribbean. Our vegan option is a refreshing Guanabana sorbet sundae made at our sister shop Mamasons, who specialises in filipino desserts and ice creams. Want to enjoy some bubbly on your special night? We got you covered. For only £5 extra, you can bring as much booze as you want. Bring that special red you’ve been saving for that special someone. Or impress you’re missus and bring in a bottle of Don Perignon. If there’s one reason to get yourself to Guanabana, its the Jerk Chicken. Marinated overnight and cooked on hot wood coal for that authentic smoky flavour. At Guanabana we believe it is necessary to cater to everyone. Not only are we fully halal- just like all your sister restaurants - but we also have many vegan, vegetarian, gluten free, and pescatarian options. But thats not all, even our drinks are all non-alcoholic. All made with love. Guanabana is located on 85 Kentish town road (near Camen market). We are only 3 minutes from Camden Road station and a further 5 minutes from Camden Town station. HALAL FOOD IN CAMDEN? SAY NO MORE. Are you looking for the best Halal restaurant in London? There’s no need to look any further. Christmas is coming a little earlier this year. What better time to get your jerk on? Freshly-grilled chicken, from our door to yours. Ramadan may have gone, but our Sunday BBQ is here to stay – by popular demand. Come hungry for our special dish, because the plate will be full. Succulent Rump roast or half a jerked hen, plantain, Baby carrots, roast potatoes, Yorkshire pudding, grilled cabbage, all topped with a jerk gravy. Cooked on wood coal, every Sunday from 12-4pm. With Ramadan approaching we understand the hunger and the cravings that come with breaking your fast. You want something delicious, filling and nutritious. So what better dish than a Sunday Roast? How cruel would it be to restrict this mother of meals to just a Sunday Brunch? So here we are, Guanabana is going to Roast for Ramadan. But not any ordinary roast. We give it our twist with jerk gravy, coal roasted jerk chicken or jerked roast rump beef. The usual accompaniments include roast potatoes, roasted veg, Yorkshire pudding and fried plantain. A meal to fill your belly and your soul! With that said in the spirit of Ramadan we will be donating £1 for every "Ramadan Roast " we sell to a great cause, " Rumi’s Kitchen." 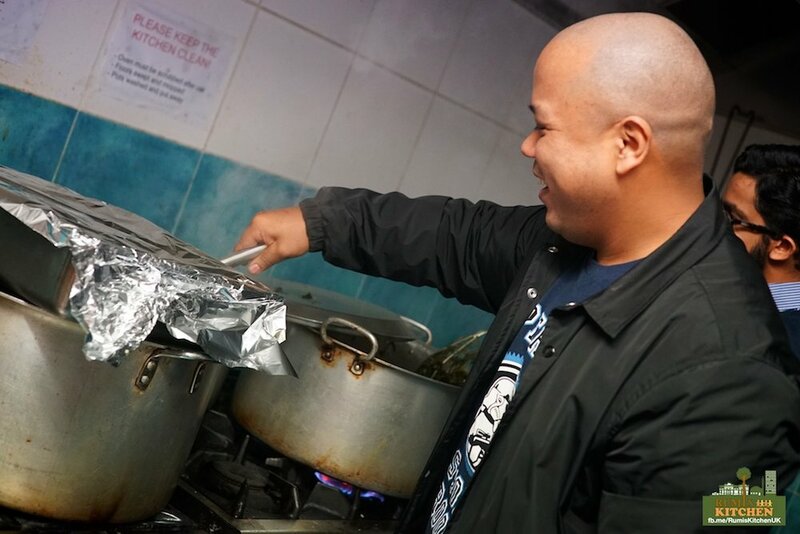 Rumi's Kitchen began in 2012, as a soup kitchen to address the increase in poverty in the Cricklewood area. The initiative has since evolved and became a community kitchen for all to tackle local issues. Their guests range from rough sleepers and low-income families to a surprising number of individuals who are socially isolated and simply come for a chat. In 2017, they opened another kitchen service in the Harlesden area in response guest feedback at having no access to a hot meal on Saturdays. At Rumi's Kitchen, guests are treated to a dining experience with meals served on real plates, with proper cutlery and glasses, an experience that we can easily take for granted. In July 2018, Rumi's Kitchen will be operating from their new community centre "Rumi's Cave" in Queens Park where they can offer three meals a day, as well as other support services. 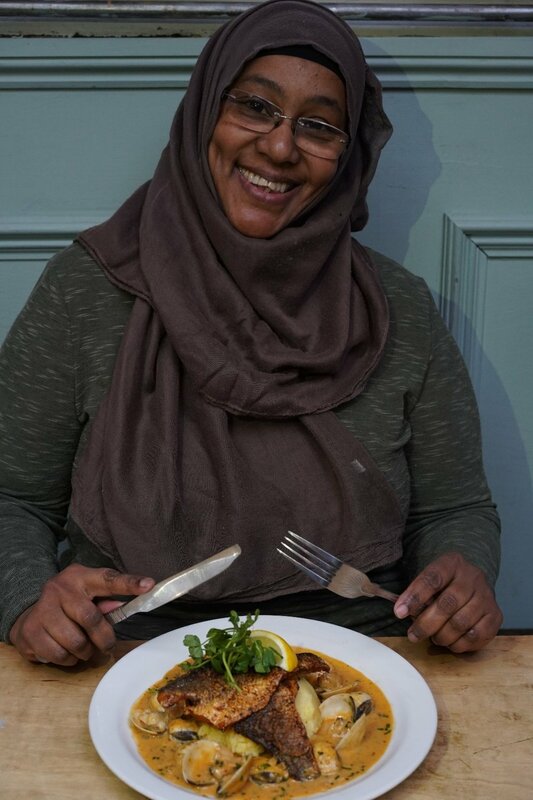 Rumi's Kitchen owes its success and longevity to their many volunteers which means every £1 donated from the Ramadan Roast will go directly to one meal for a guest! If you would like to read their full story or would like to volunteer, please visit rumis.org. Thank you and Ramadan Mubarak!